Review - the p.s. 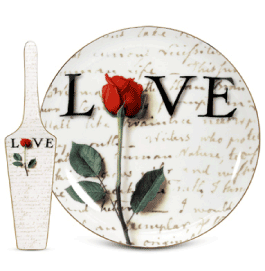 collection Cake Plate with Server from Arjang & Co.
Valentine's Day is almost here and love is in the air! If you are still searching for a unique way to express your love this holiday, have I got a place for you. 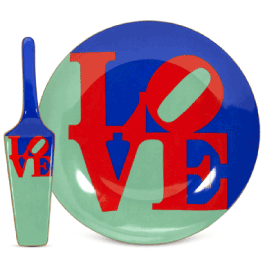 Arjang & Co. is an official licensee of the United States Postal Service and they have created some of the most original gifts all centered around the "love" stamp designs. Their p.s. I Love You collection offers a delightful new way to send and receive messages of love, passion and tenderness. I recently had the opportunity to review the All Heart Cake Plate with Server from the p.s. collection by Arjang & Co. Keep reading to learn much more! I reviewed the All Heart Cake Plate with Serverfrom the p.s. collection by Arjang & Co., which retails for $50.00. Receive 40% OFF with coupon code "MommyLiving"! I can fondly remember the All Heart "Love" stamp design from the U.S. Postal Service because I've mailed so many greeting cards, invitations and Christmas cards with this one. I always loved this stamp's design of the very small man running quickly while carrying a gigantic heart. It just summed up the feelings I had while sending out these greetings and invitations to my loved ones. When I received the All Heart Cake Plate with Server, I was blown away by the quality of this serving set. Both the 10.5" diameter serving plate and the matching server are made from fine bone china and even have a 1 mm wide 24 K gold trim around the outer edge of the serving plate and the server. The colorful All Heart design was flawlessly displayed on both products and even came delivered in a beautiful white gift box with white satin lining. This would make the perfect gift for anyone who loves to bake or entertains often. 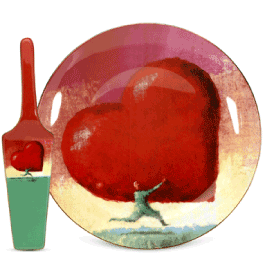 What's more, the All Heart Cake Plate with Server is both dishwasher AND microwave safe! This scores big points with me, for I hate to hand-wash anything. If you are looking for a beautiful and unique way to declare your love this Valentine's Day, I highly recommend shopping the p.s. 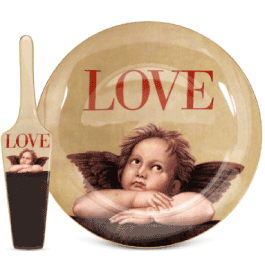 I Love You collection from Arjang & Co.. Their artist's interpretation of an official U.S. Postal Service "Love" Stamp is sure to delight and bring forth fond memories for your sweetheart every day of the year! Disclosure: I received the All Heart Cake Plate with Server from the p.s. collection by Arjang & Co. in order to facilitate my review. No other compensation was received. This product review is based on my own personal experiences with this item and is completely honest and objective.